Consider a career in the field of diagnostic medical sonography. Also known as ultrasound, technicians are trained to perform medical imaging procedures to detect a number of diseases. Anyone interested on a career in sonography may have a problem in Mississippi, as there is lower demand for medical professionals. That does not mean someone cannot have a successful ultrasonography career in Mississippi. To increase employment prospects, get certified by the American Registry for Diagnostic Medical Sonography (ARDMS), although it is not required to be an sonography tech in Mississippi. Mississippi sonography schools prepare students for careers. Sonographers use the equipment to create images of the body for diagnoses. 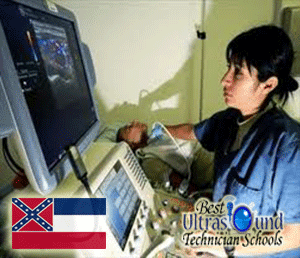 There are three schools in Mississippi with programs in diagnostic medical sonography. Hinds Community College helps students with entry-level sonographer jobs. The basic courses include an introduction to ultrasound, sectional anatomy, abdominal sonography, advanced sonography methods, obstetrics and gynecology sonography and physics. Jones County Junior College has a diagnostic medical sonography program that leads to a technical certificate or associate degree. Basic courses include classes in clinical imaging, physics, anatomy, ultrasonography, abdominal sonography, and obstetrics and gynecology. The students who complete the program are qualified to take the American Registry of Diagnostic Medical Sonography Examination. Itawamba Community College offers an Associate of Applied Science degree and certificate program in diagnostic medical sonography. The program offers instruction on general sonography. Program classes include courses in ultrasound fundamentals, physics, anatomy and physiology, abdominal sonography, advanced procedures and vascular sonography. Students are also required to carry out supervised clinical work in practical settings. As an ultrasound technologist, there is an opportunity to specialize in a number of areas, including mammography, radiology, imaging of the brain and spinal cord, obstetrics and gynecology, and ophthalmology. Different areas of specialization have different incomes. Sonographers specializing in radiology can earn a median income of up to $30.87 an hour, and those specializing in cardiac sonography earn a median wage of up to $39.28 an hour. Sonographers working in hospitals have a reported median income up to $30.85 an hour. Self employed sonographers earn the highest wages, making a median hourly income of up to $40.69 an hour or $84,635 a year.